It has been an entertaining week in UK politics. This week, the sitting Tory government became the first in history to be held in contempt of Parliament - after refusing to release the Attorney General's full legal advice on Theresa May's Brexit deal. Tories were warned repeatedly by opposition parties to release the documents, but they continually refused, despite a majority of the house previously voting in favour of the advice being released. MPs voted 311 to 293 to find the Government in contempt. The Tories have backed down, and have announced that they will now release the paper work to the house. It would appear that the opposition have asserted themselves at long last, in order to attempt to take control of this outrageous situation and have given the Tories the bloody nose that they've long deserved throughout this shambolic process. 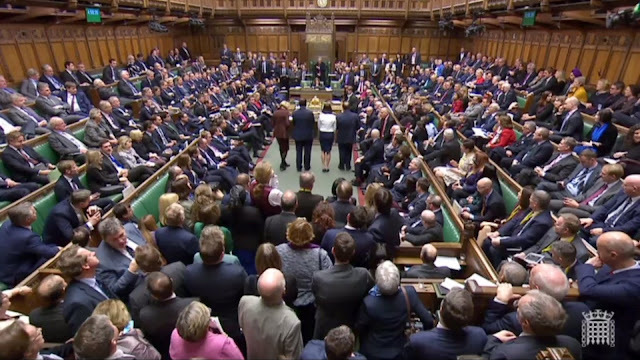 Amidst this chaotic circus - as Ian Blackford MP, Westminster leader for the SNP stood to deliver his speech - the vast majority of Tory and Labour MPs stood up and left the house. Are we surprised? 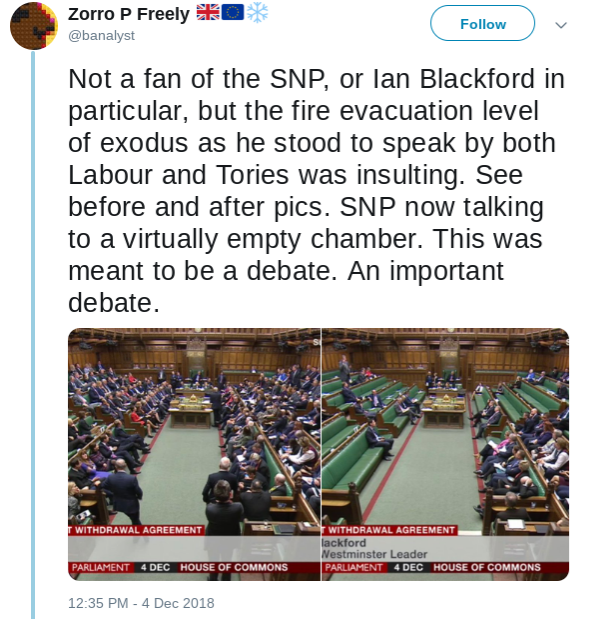 Pictured above - a Twitter user noted the utter contempt for Scotland's position during the Brexit deal negotiations, when Labour and Tory MPs evacuated the house as soon as the SNP members began to speak. Theresa May's Brexit deal will no doubt be torn to pieces, when the full legal advice has been handed to the opposition benches this week in the House of Commons. And next week, the Government is fully expected to fall flat on it's face on the 11th, when it will surely lose the meaningful vote, and quite possibly by a rather large number. The opposition parties have been completely united in opposing Theresa May's Brexit deal. She has lost the support of the DUP in many key votes, and has even lost control of her party. Labour's shadow Brexit secretary Keir Starmer has confirmed that Labour will now seek to hold a vote of no confidence in the Government when May loses the meaningful vote. However, they may wait to see how the Government reacts before making their move. Until today, it's doubtful that the Tories would have taken the threat of a no confidence motion seriously. But these are extraordinary times. And quite rightly, the SNP are keen to point out that the special treatment for Northern Ireland is a betrayal of the 62% in Scotland who voted to remain in the EU. If the Government loses a motion of no confidence, they have 14 days to try to form a new government. May would have the first opportunity to do this, and if she fails, a new Tory leader would be appointed. The new leader could then try to get the DUP back on side. If not, then it's another General Election. But this is not the only trouble that May faces - Tory back benchers are also plotting a vote of no confidence in the Prime Minister. And with the very real threat of the opposition's no confidence motion, Tory back benchers may wish to get their challenge in first before the opposition have the chance to do so. Don't get your hopes up - but there is the slightest chance that Theresa May's Tory Government could collapse within weeks. Where does this leave Scotland? Your guess is as good as mine.